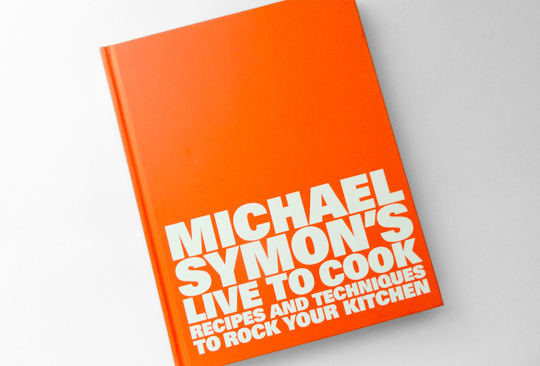 In case you didn't know that Michael Symon, author of Michael Symon's Live to Cook: Recipes and Techniques to Rock Your Kitchen (Amazon ) appears on Iron Chef America, it says it right there on the front cover byline: "Michael Symon of Iron Chef America." For some people out there (and it's cool if you're one of them — without that show, I might never have fallen in love with Jeffrey Steingarten) this is the reason they'll pick up the cookbook. There's the tie-in angle, the familiar face. 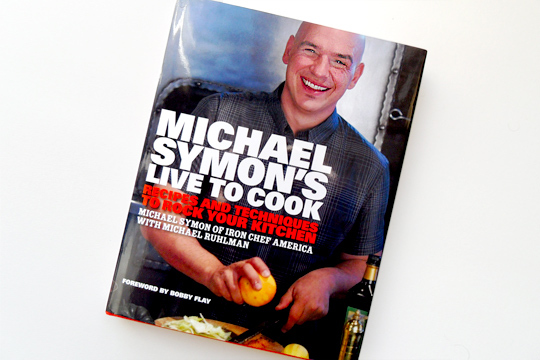 Michael Symon is so cool, the book promises. He's that guy from TV! He has tattoos! He wants to rock your kitchen! But if you can make it past that cover line — not to mention Bobby Flay's plodding, golf-referencing foreword, or the overall vibe of sanitized badassery (the subtitular use of "rock" as a verb, the internal use of semi-gothic typefaces) — you'll find something terrific. Take off the dust jacket and throw it away. 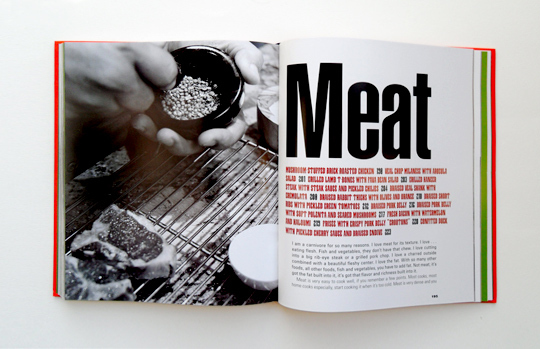 Flip past Flay's tepid two pages, ignore some of the graphic design, and all of a sudden you'll find yourself in the middle of the most exuberant kind of cookbook: one that's designed, completely and totally, to be cooked from. Symon's story, as he tells it (with aid from his writing partner, the omnipresent Michael Ruhlman), is the sort of tale that makes starry-eyed young people want to enroll in culinary school. A CIA grad, he moved home to Cleveland, picked up work at a small restaurant run by a passionate chef, and was promptly and attentively treated as a beloved apprentice. From there he ran a handful of kitchens, and eventually he and a ragtag team of talented misfits drained their bank accounts, bought a restaurant, and right out the gate were the hottest ticket in town. A Food & Wine Best New Chef award came out of the blue shortly thereafter, and from there it was fame and glory and media, The Next Iron Chef, then Iron Chef America, and now, as the brand demands, a cookbook. Except it's not really like that. Because there are three things about Michael Symon that are very important to know, and which both shift the preceding portrait of a culinary fameball, and give a heft to Live to Cook that elevates it beyond its ridiculous cover. First, Symon is a very, very good cook, and not just in the cookie-cutter way that anyone with decent technique and access to top-notch ingredients can be a "very good cook." Second (and perhaps to the Food Network most important), he is a smart guy who also just happens to be terrifically charming. Third, this is a man who loves cookbooks. Every ounce of all of that comes through in this book: the talent, the smarts, the charm, the respect for the medium. And the reveal doesn't come slowly, right there in the introduction there's a punch in the face that tells you that this is not your average vanity project/contractual-obligation cookbook: "I have never wanted simply a collection of recipes," Symon writes. "Recipes are important but only to a point. What's more important than recipes is how we think about food, and a good cookbook should open up a new way of doing just that." It's so simple, and it's so true: while recipes are the skeleton of any cookbook, the real meat — the thing that gives the recipes cohesion and purpose — is everything else, especially the author's point of view. The wonderful thing is that Symon makes good on his promise to "open up a new way" of thinking about food — though not, it is worth noting, anything that will be terribly new for the seasoned home cook. Live to Cook is a book geared for beginners, with large, friendly fonts and helpful boxes explaining things like the difference between caramelizing and sweating, or the importance of using high-quality stocks. The recipes, too, are simple (though this can be credited just as easily to Symon's "if it takes more than two pans, I won't make it" philosophy), but without the dumbed-down tone that can easily sour a text aimed at the inexperienced. He urges his readers to cure their own lamb bresaola, to experiment with hot vinaigrettes, to confit pig ears for fourteen hours in a crock-pot. The technique may be entry-level, but the palate assuredly is not. And thanks to that, there's plenty here for more advanced cooks, too. After all, Symon rose to fame thanks to his terrific cooking, and the flavor pairings in some of these dishes are worth the cover price: fried Brussels sprouts with walnuts and capers, poached foie gras bratwurst, grouper spiked with jerk seasoning, hanger steak set off by pickled chilies. Even the book's organization is something of a revelation. The "stocks, sauces, and condiments" chapter comes smack in the middle of the book, leading us in to the entree chapters rather than being buried in the back as it is in most cookbooks. Symon isn't a pastry chef and so, hallelujah, there is no dessert chapter. 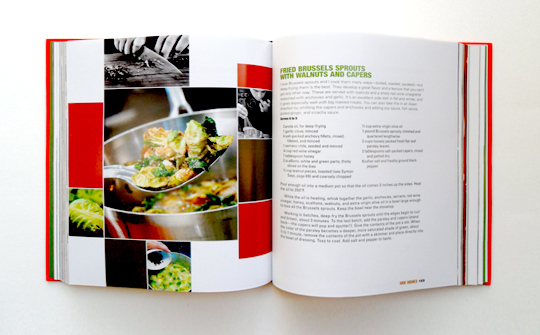 "I think all chefs at least on some level, want their own cookbook," Symon reflects in Live to Cook's introduction. "Not for posterity but rather, on some level, for permanence, because what we do nightly disappears faster than it takes to create it. Our work, if it's any good, vanishes and the better it is, the faster it goes away." The upshot of a cookbook isn't just preservation, though — it's also perpetuation. Not only are Symon's recipes now preserved for the long haul, they're also able to be recreated by anyone with access to olive oil and a hotplate. Not bad for an Iron Chef. The phrase "sanitized badassery" describes exactly why I find Michael Symon insufferable. What did you cook from this book? Do the recipes work? There should be no reviews if one does not actually cook from the book. It's not clear that this is the case with the review. Unless we're talking pastry recipes (which is much more of a science), "Do the recipes work?" seems like a tricky thing to answer. By "work" do you mean that if you follow the instructions, that the raw elements are transformed into something edible? Delicious? Very delicious? Does it turn out like the photo? What if the reviewer totally hates cheese on her hamburger (theoretical! ), but the recipe calls for it, does that make it not "work"? Interesting review; however I would like to comment on your assessment of Flay's forward. "Plodding?" I'm curious how a one and a half page forward can be plodding. Since you give no examples, I put it down to lazy writing. "Golf referencing?" Golf is mentioned once. Again, lazy writing. This sounds like the typical backlash against a celebrity chef (if he/she is popular, they can't possibly be any good). Flay is on FN. Symon is on FN. Flay has multiple restaurants. Symon has multiple restaurants. Flay has won a James Beard award. Symon has won a James Beard award. Personally, I admire them both; each of them had "street cred" long before FN. If people don't care for their personalities, that's fine--but what does that have to do with their food? I'd love to hear about recipes as well. The only one I've seen is his Tomato and Blue Cheese Soup, and it's enough to make me want more (and at least go find the hard copy and thumb through it to see what else I'm missing). The soup recipe is reprinted here, if anyone's interested. Michael Symon's Spicy Tomato and Blue Cheese Soup: http://www.freckledcitizen.com/2009/11/feeding-your-indecision-and-optimism.html.